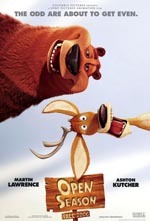 What did you think of Open Season? A cute movie for kids to enjoy, with their parents. I generally like these types of movies, where you can go into it, without kids and not only not feel weird, but actually enjoy the movie yourself. These days, when studios make a “kids” movie, they try to throw in some adult humor, and jokes that the kids wouldn’t get. Open Season had a few of these jokes. Not nearly enough for me to say I liked it as much as Monsters, Inc, or Ice Age, but it was still a cute flick. I got the feeling that the voice actors, though a great cast of them, were trying entirely too hard to push themselves through the cartoon animation, and make themselves appear onscreen. It doesn’t work so well, in most of the cases. I think I would have enjoyed this movie a lot more if I had brought my nephew with me. Sometimes it takes a kid laughing hysterically, at something they don’t understand, to make an adult have a good time. Maybe I’m just too old for kids movies nowadays, who knows. I would have liked to enjoy the movie more than I did. And it seems like studios now are just making kids movies, because they feel they have to, and aren’t investing enough time into them, to make them worth while. I can’t recommend, nor not recommend this movie to anyone. While I personally didn’t care for it, others (with children in tow) might enjoy it a lot.